The Great 12 to Midnight Buried Tales Treasure Contest! 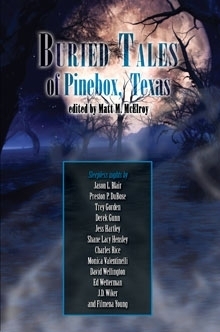 12 to Midnight is having a treasure hunt contest to celebrate the new book, Buried Tales of Pinebox, Texas. 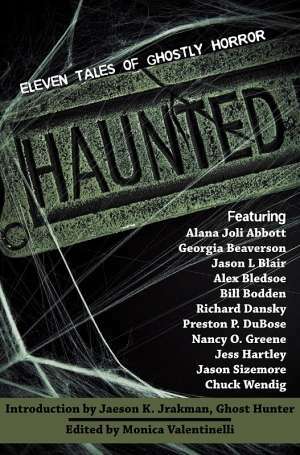 This book contains 12 tales of Modern Horror by Shane Hensley, Jason Blair, Derek Gunn, Jess Hartley, Charles Rice, Monica Valentinelli, David Wellington, Filamena Young, JD Wiker and others. You can purchase Buried Tales (dead tree version) from many sites, or you can get the pdf or the kindle edition. Scour the Buried Tales Stories to dig up the answers to earn the treasure. Answer the questions found at www.12toMidnight.com and look for weekly clues posted on our website to help you with your search. Send your answers to Admin@12toMidnight.com by Sept. 1st, 2009. Up to three entries will be chosen at random to win the prize package of Treasure. The winning entries must have the correct answers to the Treasure Hunt to be placed in the hat for the random drawing. In other words, if only one entry has all the correct answers, that entry will win by default, so get cracking! One of three will be named the Grand Prize Winner and also receive signed copies of Last Rites of the Black Guard and Skinwalker. 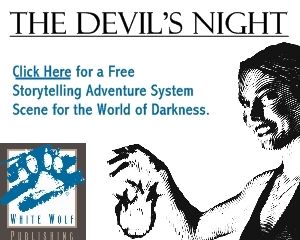 Every pdf title written or owned by 12 to Midnight for both the Savage Worlds and OGL burned to cd and mailed to your home. AND…an autographed dead tree copy of Fear Effects, Last Rites, and the upcoming Skinwalker. That’s over $400.00 in value. So get started on the challenge and win it all!